Aim: The purpose of this study is to evaluate the resin-dentin interface, quality of the hybrid layer of total-etching and self-etching adhesive systems under scanning electron microscopy (SEM). Materials and Methods: Class V cavities were prepared in 40 extracted human molars. In Group I XP bond (Dentsply), in Group II Adper Single Bond II (3M ESPE), in Group III Adper Easy One (3M ESPE), and in Group IV Xeno V (Dentsply) were applied. Teeth were restored with resin composite, subjected to thermocycling, and sectioned in Buccolingual plane. The samples were demineralized using 6N HCl, for 30 sec, and deproteinized with 2.5% NaOCl for 10 min, gold sputtered, and viewed using a scanning electron microscope. Results: Among the total-etch systems used, the XP Bond showed a clear, thick hybrid layer, with long resin tags and few voids. Among the self-etch adhesive systems, the Xeno V did not show a clearly recognizable hybrid layer, but there were no voids and continuous adaptation was seen with the dentin. Conclusion: The adaptation of self-etch adhesives to the resin-dentin interface was good without voids or separation of phases; showing a thin, continuous hybrid layer. Reality always seems to fall short of conceptualization, a variety of researchers in dentistry, brought a longstanding dream to fruition by providing adhesives that could effectively bond composites to dentin as well as enamel. However, it is difficult to achieve, as the bonding process to dentin is very different from that for enamel. Dentin is more humid and more organic than enamel, which makes bonding a difficult task, unlike enamel, which is mostly inorganic in nature. Hence, the purpose of this study is to evaluate the morphology of the resin-dentin interface of the new total- and self-etching systems and to assess the quality of the hybrid layer formed. The present study was conducted at the Department of Conservative Dentistry and Endodontics, A.B. Shetty Memorial Institute of Dental Sciences, Mangalore. Forty, freshly extracted caries-free human molars were collected and stored in saline at room temperature. All the teeth were examined and the teeth with caries or cracks were discarded. The teeth were then randomly and equally divided into four groups. Protocols in cross-infection control as per Occupational Safety and Health Administration regulations in storing, surfacing, and utilization were observed. The 40 extracted teeth stored in saline were retrieved and Class V cavities (2 mm X 1.5 mm X 1.5 mm) were prepared in selected teeth using a No. 245 tungsten carbide bur; the length of the cutting end of the bur was approximately 3 mm. After preparation of Class V cavities in the 40 teeth, they were randomly divided into four groups of 10 specimens each. In Group I, the prepared dentinal surfaces of the teeth were etched with etchant, 35% phosphoric acid, for 30 sec, and washed. The surface was slightly blotted with gauze to produce a visible moist dentin surface to produce moist dentin. The resultant moist surfaces were treated with a total etching bonding agent (XP Bond, Dentsply) and cured as per manufacturer's instructions. In Group II, the prepared dentinal surfaces of the teeth were etched with etchant, 35% phosphoric acid, for 30 sec, and washed. The surface was slightly blotted with gauze to produce a visible moist dentin surface to produce moist dentin. The resultant moist surfaces were treated with total etching bonding agent (Adper Single Bond 2, 3M ESPE) and cured as per manufacturer's instructions. In Group III, the resultant moist dentin surfaces were treated with One-Step Self-Etching Bonding Agent (Adper Easy One, 3M ESPE), by applying a uniform layer, avoiding pooling, gently agitating with a microbrush for 20 sec, and allowing them to dry in a mild air stream for 10 sec. A second layer was applied with a microbrush, avoiding any pooling, and it was allowed to dry in a mild air stream for 10 sec. The bonding agent was light cured for 20 sec. In Group IV, all the prepared dentinal surfaces of the teeth were cleaned and blotted with gauze to produce visible moist dentin. The resultant moist dentin surfaces were treated with a One-Step Self-Etching Bonding Agent (Xeno V, Dentsply) by applying a uniform layer, avoiding pooling, and allowing them to dry in a mild air stream for 10 sec. The bonding agent was light cured for 20 sec. The Class V preparations were then restored with hybrid composite in an incremental technique of 1 mm each, curing each layer for 40 sec. Specimens were then stored in distilled water under room temperature. The restored specimens were then subjected to thermocycling (500 cycles, 5 to 55 C, 30 sec dwell time). Following thermocycling, the teeth were sectioned longitudinally through the restoration in a Buccolingual plane. Two sections were made per tooth, producing two specimens, which were polished with an increased grit of silicon carbide paper, under running water. A total of 20 specimens from each group resulting in 80 specimens were prepared. The specimens were demineralized using 6N HCl for 30 sec and deproteinized with 2.5% NaOCl (Sodium hypochlorite) for 10 min, to enable examination of the interface and left to dry for 24 h. The specimens were gold sputtered and morphological evaluation of the resin-dentin interface was conducted using scanning electron microscopy under various magnifications. 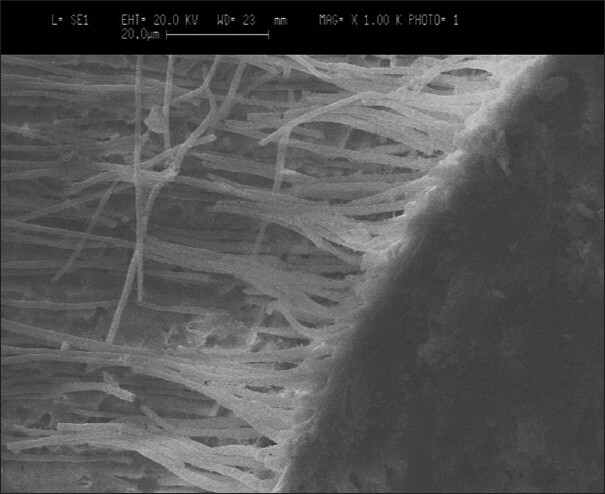 Group I - Scanning electron microscopic evaluation showed a clearly recognizable hybrid layer, which was thick, defined, and continuous. The thickness of the hybrid layer ranged between 3 - 8 μm. There was no adhesive failure seen between the resin-dentin interface. However, few areas showing cohesive failure were seen within the resin and the resin-composite interface. The length of the resin tags ranged between 10 - 25 μm. The resin tags showed numerous lateral tags. Few voids were noticed on the resin tags [Figure 1]. 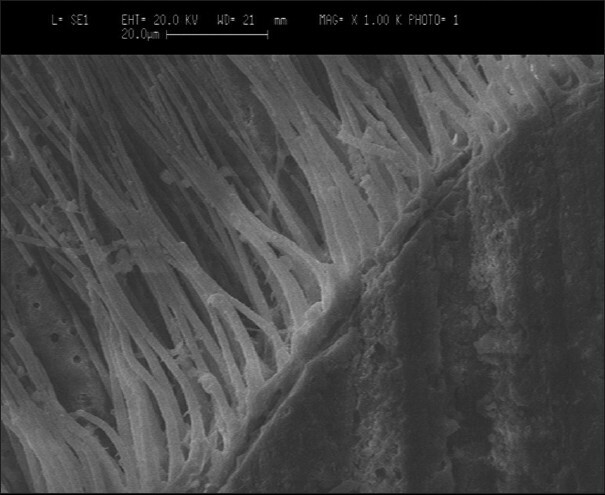 Group II - A scanning electron microscopic evaluation of the specimens showed a clearly recognizable thin hybrid layer. The hybrid was clearly defined and the thickness ranged between 3 - 6 μm. However, there were areas where there was a visible region of separated layers showing adhesive failure between the dentin and resin interface. There were few areas of separation between the composite and resin interface indicating a cohesive failure. The length of the resin tags ranged between 8 and 20 μm. The resin tags were in the shape of inverted cones. Few voids were seen on the resin tags and they showed few lateral tags [Figure 2]. Group III - A scanning electron microscopic evaluation of specimens showed a thin hybrid layer that was not clearly distinct and no discontinuity was noticed. However, there was no adhesive or cohesive failure observed. The thickness of the hybrid layer ranged between 0.8 - 1.4 μm. Few resin tags were observed with a range of 1 - 2 μm. There were no voids observed and few lateral tags were observed [Figure 3]. Group IV - A scanning electron microscopic evaluation showed no evidence of a hybrid layer. 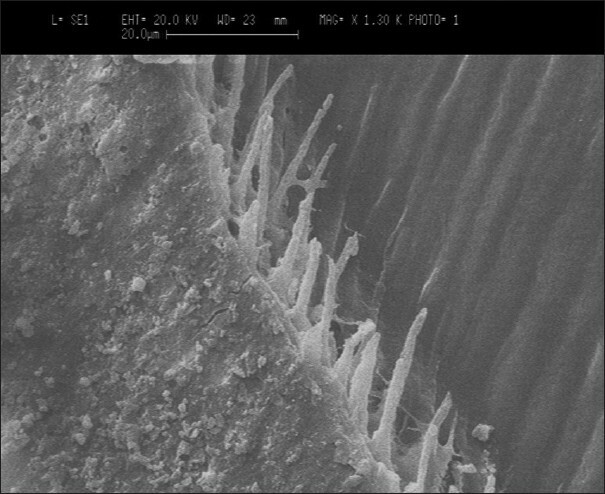 The junction between the resin-dentin appeared to be tight, thin, and continuous with no adhesive or cohesive failure. Minimal formation of microtags was noticed under higher magnification with a range of 0.6 - 1.5 μm. There were no evident lateral tags. Some of the dentinal tubules appeared to be obstructed by smear plugs [Figure 4]. Group III and Group IV, self-etch adhesives showed thin hybrid layers, with fewer microtags. However, there is no evidence of adhesive or cohesive failures observed with self-etch adhesives. Within the limitations of the present study, however, the scanning electron microscopy method can provide basic information, which points to the possible specific features of the interface, which need to be examined closely. In vitro studies depend on variable parameters, such as, sample collection, surfacing, aging, thermocycling, and hurdles in specimen preparation, for scanning electron microscopy. There being a clinical correlation with long-term studies on the effects of aging, thermal effects on the bonding process need to be examined closely. From the present study it is concluded that: XP Bond, among the total-etch bonding agents, showed good penetration of resin into the dentin by the presence of long resin tags and a thick hybrid layer. Xeno V, among the self-etch bonding agents, did not show a clear hybrid layer with few resin tags, but showed a continuous adaptation along the dentin surface. 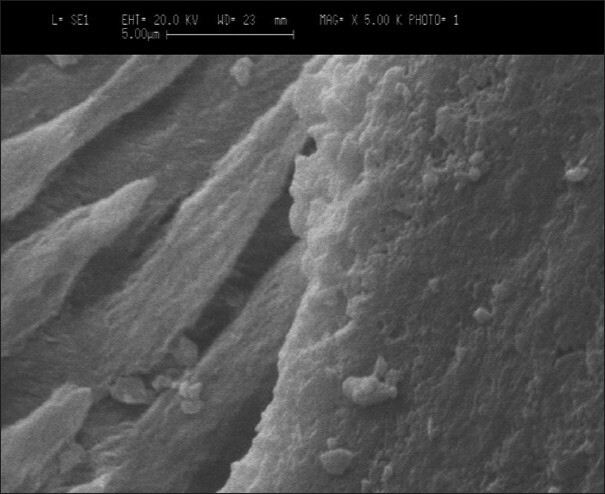 The adaptation of self-etch adhesives to the resin- dentin interface was good without voids or separation of phases; showing a thin, continuous hybrid layer. It was concluded that such an adaptation of resin with dentin tissue, as in the case of self-etch adhesives, was required for better treatment outcome to reduce postoperative sensitivity. 1. Radovic I, Vulicevic ZR, Garcia-Godoy F. Morphological evaluation of 2- and 1-step self-etching system interfaces with dentin. Oper Dent 2006;31:710-8. 2. Ceballos L, Camejo DG, Victoria Fuentes M, Osorio R, Toledano M, Carvalho RM, et al. Microtensile bond strength of total-etch and self-etching adhesives to caries-affected dentin. J Dent 2003;31:469-77. 3. Wang Y, Spencer P. Hybridization efficiency of the adhesive/ dentin interface with wet bonding. J Dent Res 2003;82:141-5. 4. Eliades G, Vougiouklakis G, Palaghias G. Heterogenous distribution of single-bottle adhesive monomers in the resin-dentin interdiffusion zone. Dent Mater 2001;17:277-83. 6. de Alexandre RS, Sundfeld RH, Giannini M, Lovadino JR. The influence of temperature of three adhesive systems on bonding to ground enamel. Oper Dent 2008;33:272-81. 8. Tay FR, Pashley DH. Aggressiveness of contemporary self-etching systems. I: Depth of penetration beyond dentin smear layers. Dent Mater 2001;17:296-308. 9. Van Landuyt KL, De Munck J, Snauwaert J, Coutinho E, Poitevin A, Yoshida Y, et al. Monomer-solvent phase separation in one-step self-etch adhesives. J Dent Res 2005;84:183-8. 10. Van Meerbeek B, De Munck J, Yoshida Y, Inoue S, Vargas M, Vijay P, et al. Adhesion to enamel and dentin: Current status and future challenges. Oper Dent 2003;28:215-35. 11. De Munck J, Van Meerbeek B, Yoshida Y, Inoue S, Vargas M, Suzuki K, et al. Four-year water degradation of total etch adhesives bonded to dentin. J Dent Res 2003;82:136-40. 12. Perdigao J. New developments in dental adhesion. Dent Clin North Am 2007;51:333-57. 13. Perdigao J, May KN, Wilder AD Jr, Lopes M. The effect of depth of dentin demineralization on bond strengths and morphology of the hybrid layer. Oper Dent 2000;25:186-94. 14. Nakabayashi N, Saimi Y. Bonding to intact dentin. J Dent Res 1996;75:1706-15.